The 2019 $0 down, VA home loan limit for Gem County is $484,350. 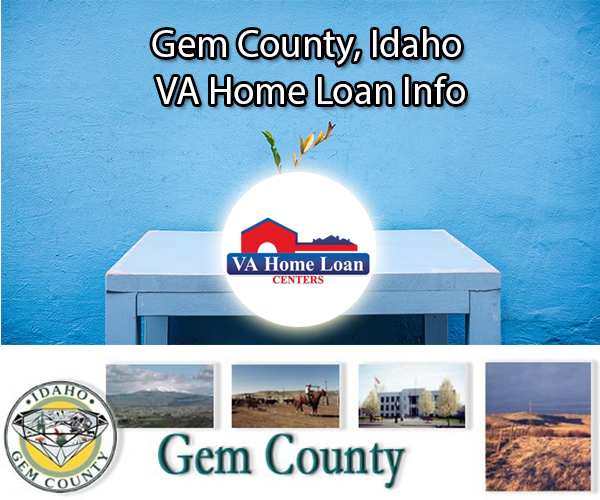 Gem County is located in western Idaho and is great for people looking for a friendly community and beautiful landscape. The county is named after the state nickname, “Gem State,” and was officially established by the Idaho State Legislature on March 15, 1915. Home to part of the Boise National Forest and several bodies of water, Gem County is a great place for nature lovers. With a total area of only 566 square miles, Gem County is the fifth-smallest county in Idaho. There are many annual celebrations held in Gem County each year! Boise National Forest is a national protected area, partly located in Gem County. Boise National Forest is home to many beautiful sights, including colorful flowers, lush trees, and snow-capped mountains. There are several bodies of water located in the Boise National Forest, which makes it a great location for swimming, boating, and fishing. Some of the diverse flora that can be found in the area include ponderosa pine, mountain snowberry, mountain maple, huckleberry, and much more! Mule deer, elk, beavers, and marmots are just a few of the animal species that can be seen in the Boise National Forest. Avid history buffs are sure to enjoy the Village Museum, which is run by the Gem County Historical Society. Open year-round and free to all visitors, the Village Museum is a great place for people of all ages. Some of the exhibits in the Village Museum include a Blacksmith Shop, Little Red School House, Bunkhouse, and much more! The Hunt House is a cottage built at the turn-of-the-century that contains antique furniture. Tours are available to everyone at the Village Museum. Lovers of golfing should enter the Annual Golf Tournament. With tournaments for both men and women, the Gem County Annual Golf Tournament brings in avid golfers from all over the state. Another fun event held in Gem County is the Annual Harvest Festival and Street Fair, which celebrates the rural lifestyle. The event is completely free and features great food, fun games, entertainment, and much more! Other great events held in Gem County include the Emmett Cherry Festival and the Simply Baked Ribbon Cutting. Several veteran resources, including medical facilities, are located in proximity to Gem County. The State of Idaho Military Office and Idaho National Guard Post are both just a short drive away from Gem County. Benefits offered to veterans living in Idaho include employment and medical benefits. The median housing cost in Gem County is $150,400, and the median household income is $44,432. Make the home buying process easy by completing a VA loan application with VA Home Loan Centers. Call VA Home Loan Centers at 888-573-4496 for help finding a VA-approved property in Gem County. There are not currently any VA-approved condos located in Gem County. Let VA Home Loan Centers help you easily obtain VA condo approval.